On July 6, when the Tour de France begins with the Grand Départ in Brussels, Continental will embark upon its first year as one of the Tour’s five Main Partners – alongside LCL, E.Leclerc, Krys and Skoda. The Main Partners benefit from enhanced visibility, not least when the winners of each stage are presented with their trophies. Christian Prudhomme, Director of the Tour de France, adds: “The joy of winning a stage is a daily emotion on the Tour de France. The rider that lifts his arms at the finish line, whether he is a many-time victor or takes his only career win, surely experiences one of the highlights of his life. Continental associates its image to these thrills, which are also linked to the notion of performance, defended at the highest level by the brand of tires. The Tour champions, from Brussels to Paris via Saint-Etienne, the Tourmalet or Nîmes, will recognize themselves in this quest for excellence that defines Continental". This year, six World Tour teams (Sky, FDJ, Movistar, Bahrain-Merida, Katusha-Alpecin, Sunweb) will be racing on the high-end Competition Pro LTD tire from Continental, specially designed and hand-made in Korbach, Germany. 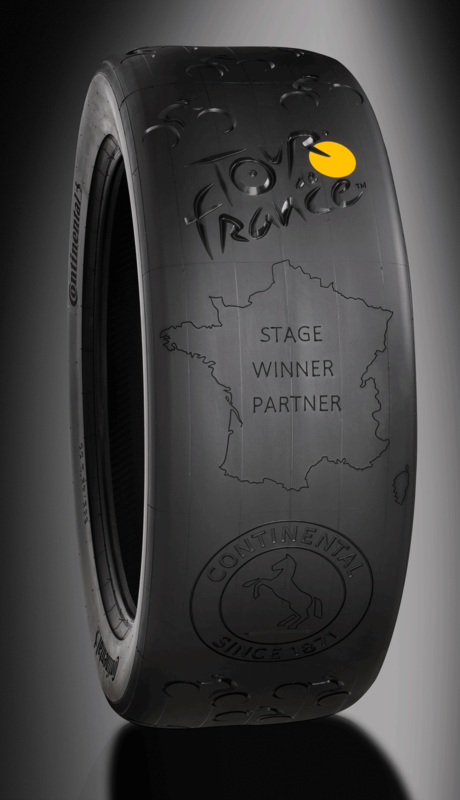 In addition, drivers of the official vehicles of the Tour de France will get to savor the performance of the latest Continental car tire, the PremiumContact 6, which is manufactured in Sarreguemines, France. So when it comes to tires, the Tour de France is a Franco-German success story. As one of the five Main Partners to the event, Continental will enjoy greater visibility throughout the Tour. The Continental logo will appear on the arch above the finish line as well as on the “flamme rouge” arch, one kilometer from the finish. After each stage, a representative of Continental will present the trophy to the stage winner on the podium. The technology company is also making use of its partnership with the Tour de France to promote its “Vision Zero” strategy, for a world without road fatalities, injuries or accidents. This year too, the tire manufacturer will be exploiting the magnetic attraction of the race to call for drivers and cyclists to show more consideration for each other through its “Sharing the Road” and “Stay Wider of the Rider” campaigns. And on its website, Continental will be offering Tour fans tips on traveling to and from the various stages in safety. In addition, well before the riders pass by, the tire manufacturer will again be offering free mobile tire checks for vehicles parked along the route. On the course itself, for the first time ever, dangerous corners will be highlighted for riders and support-vehicle drivers with special warning signs in bright Continental yellow. The history of tire manufacturing at Continental stretches all the way back to 1892 when the first air-filled “Pneumatics” bicycle tire was produced, while the first car tire followed in 1898. That makes Continental the tire manufacturer with the longest tradition in Germany. Today the company is working to enhance its two-wheeler and car tires by sharing some of the same technologies. By way of example, the “Black Chili” compound provides high grip not only in Continental bicycle tires but in the company’s high-performance car tires as well.